Alex Sigmund, DVM, is currently completing a specialty ophthalmology internship with BluePearl Veterinary Partners of Florida. He will subsequently begin his residency in veterinary ophthalmology at the University of Tennessee starting July 2018. He previously completed a small animal rotating internship at the University of Tennessee and received his DVM from the University of Georgia. His favorite aspects of ophthalmology are surgery and ocular manifestations of systemic disease. Ocular perforations can occur for a variety of reasons, and their appearance can vary significantly depending on size, etiology, and chronicity. It is important to recognize when an eye has ruptured or perforated, as surgical correction may be required to maintain the integrity of the eye and ensure the best prognosis for long-term vision and comfort. 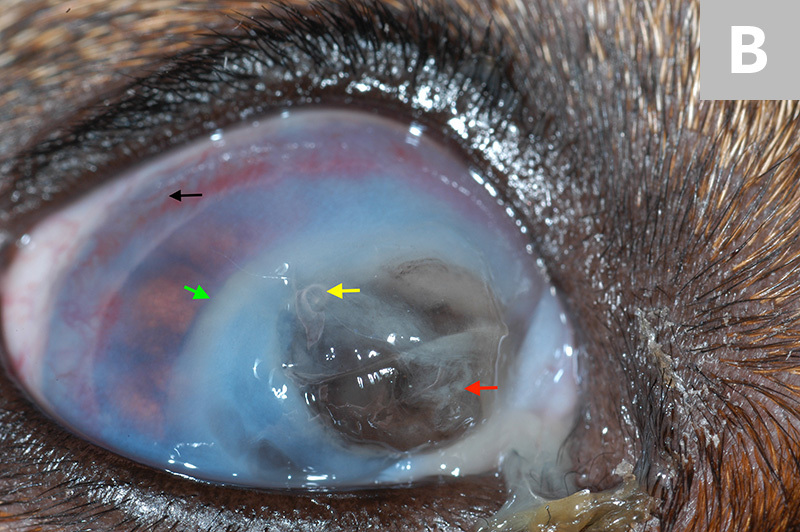 Figure 1 Corneal perforation in a dog with corneal degeneration, most likely calcific degeneration (red arrows). 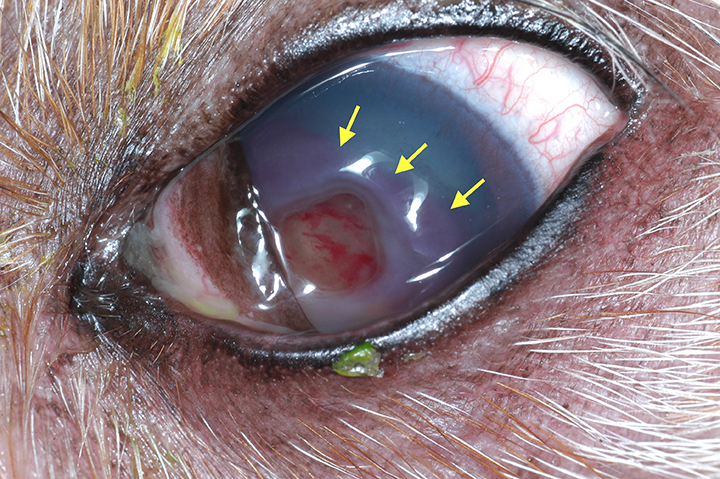 Calcific degeneration of the cornea is noted in older dogs or results from previous corneal inflammation or injury. As the calcium builds up, it can then slough, resulting in an ulcer. If the ulcer is deep, it could then perforate. A fibrin plug is visible, with pigment likely from secondary iridal prolapse/anterior synechiae (yellow arrow). There is conjunctival hyperemia but no obvious keratitis or neovascularization; in addition, except for the degenerative change, the cornea is largely clear. The degenerative changes to the cornea are chronic and progressive, but the perforation is acute. 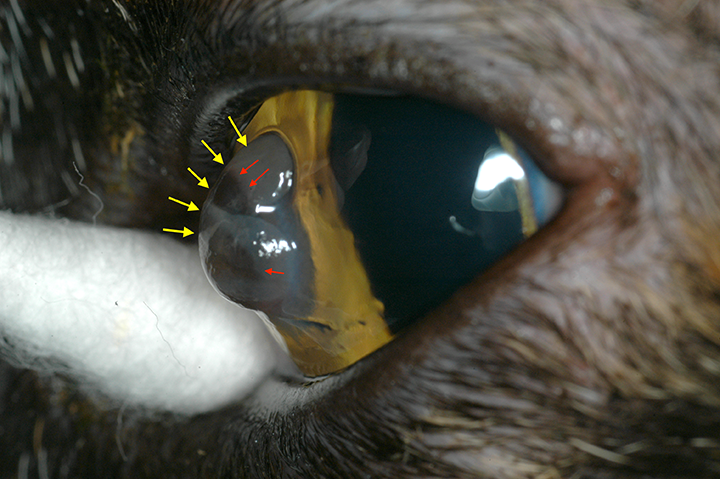 Figure 2 Intraoperative image showing scleral perforation from a cat claw before surgical repair (red arrow). A fibrin plug is visible protruding through the sclera, along with some bleeding around the plug from a conjunctival laceration (black arrows). 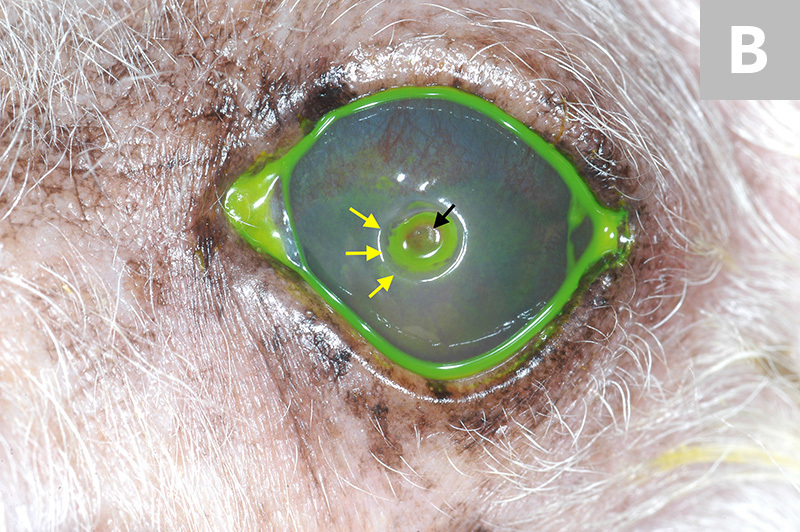 Hyphema (yellow arrows) and adjacent corneal edema (green arrow) secondary to the injury is also present, further indicating a penetrating injury. As this figure illustrates, penetrating injuries to the globe do not always involve the cornea and are not always easily visible. A thorough extraocular examination is warranted. 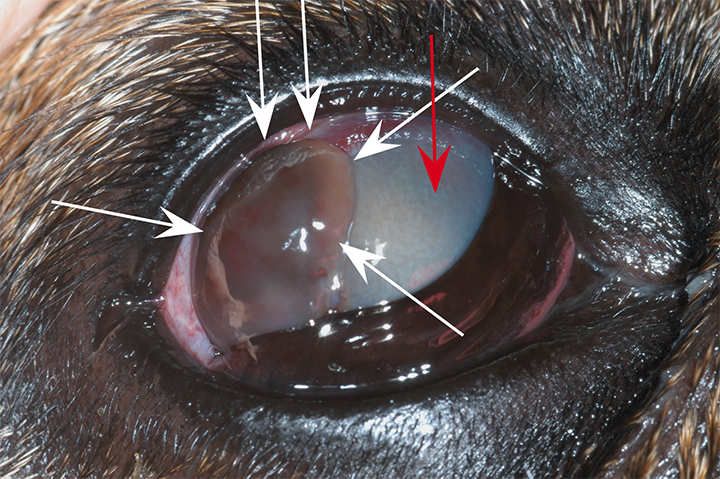 Figure 3 Chronic corneal ulceration/perforation in a dog. Blood is visible in the fibrin plug (yellow arrow). Because neovascularization is at the periphery of the defect, the blood is likely uveal in origin. Extensive superficial corneal neovascularization with concurrent corneal edema (red arrow) from the dorsal and ventral limbus are also present. The presence of the vessels extending to the defect indicate chronicity of the lesion. It is unknown at what point in the development of the vessels the perforation occurred; however, based on patient history, the dog had a chronic ulcer that likely became infected, with subsequent melting and perforation. 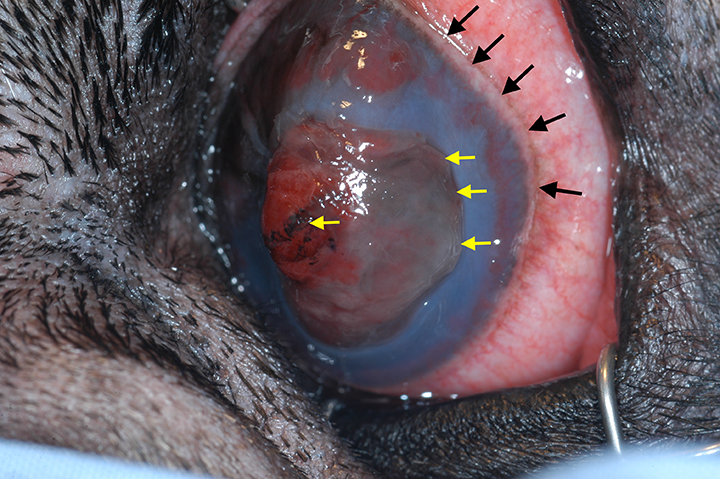 Figure 4 Healed corneal perforation in a dog. A dense axial corneal scar is visible, with a nasal wedge of pigment deposition extending axially. This pigment deposition (red arrows) is likely secondary to neovascularization during the healing process as well as medial canthal trichiasis. Neovascularization is still present and can be seen extending from the limbus to the perforation site; however, the vessels (yellow arrows) appear smaller in diameter than those in Figure 3 and are likely in the process of receding. The vessels may gradually disappear, creating ghost vessels. The vessels in Figure 3 appear more robust as they are actively responding to the perforation. 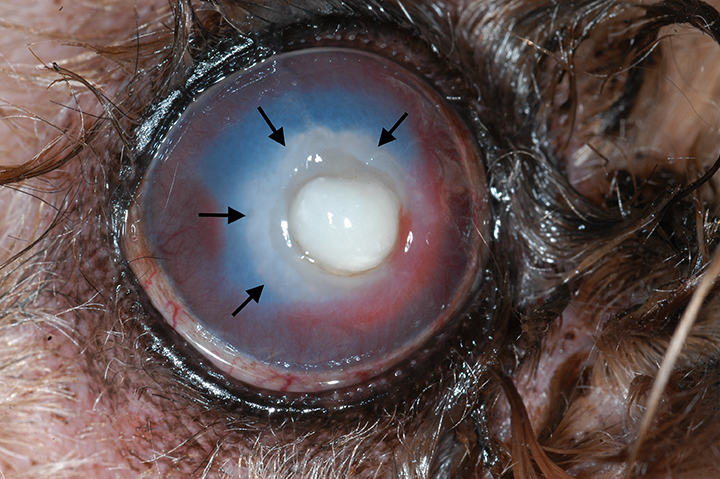 Figure 6 Corneal perforation secondary to a descemetocele in a dog. A fibrin plug with iridal prolapse can be seen, as evidenced by the pigment in the plug. The pupil in the region of the prolapse is distorted from anterior synechiae (yellow arrows). 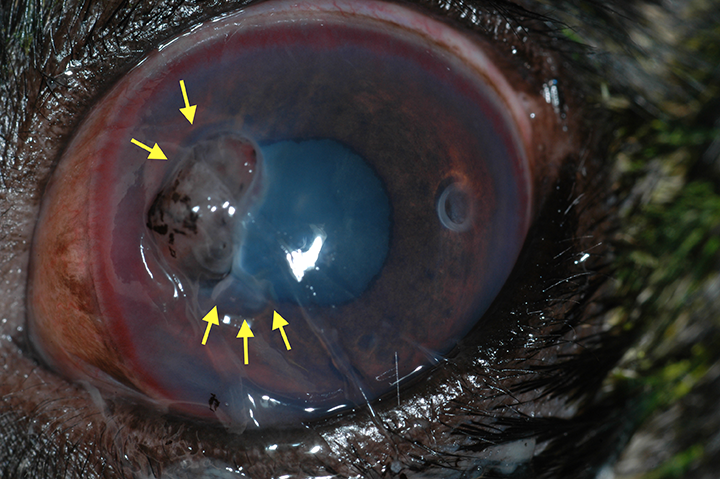 Figure 7 Corneal perforation with secondary (hypermature cataract) lens luxation through the perforation site. The black arrows denote the part of the lens that is still present in the anterior chamber; a portion of the lens can be seen extruding through the perforation. There is marked corneal edema and neovascularization extending toward the perforation. 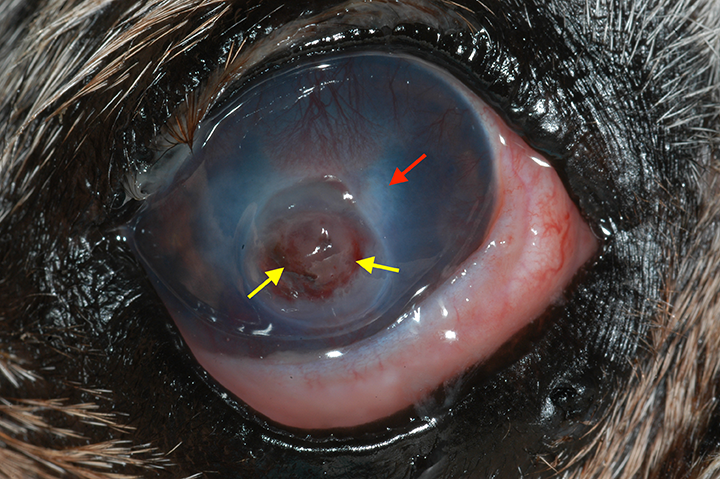 Figure 8A Corneal perforation secondary to a descemetocele in a dog. Corneal neovascularization (yellow arrows) with visible blood in a fibrin clot (black arrow), along with a red intraocular haze that is hyphema (green arrows), is visible. Figure 8B Corneal perforation secondary to a descemetocele, stained with fluorescein. 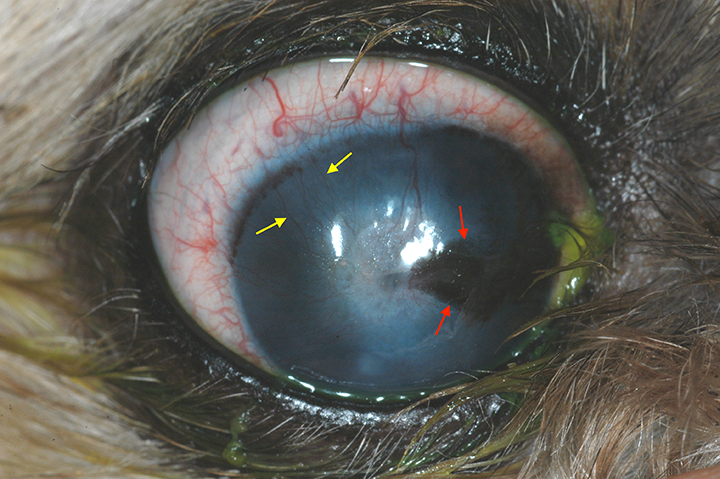 Portions of the corneal ulcer and associated defect have epithelialized as evidenced by the rounded edges of the ulcer margin (yellow arrows); however, some stain is still retained and pooled in the perforation site. The fibrin plug stained poorly, which should not be interpreted as the ulcer being healed (black arrow). 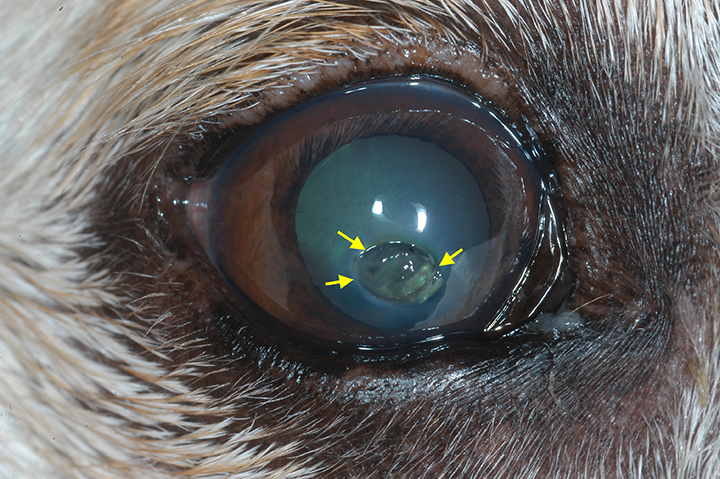 Figure 9 Corneal perforation in a dog with no obvious secondary anterior uveitis. 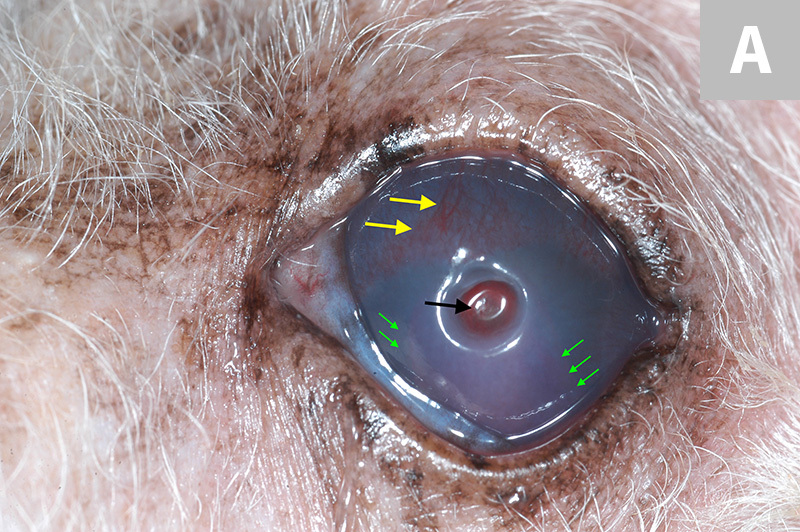 A fibrin plug is visible protruding from the perforation (yellow arrows), but no hyphema or hypopyon is present. The cornea is clear and, except for the perforation, the eye is quiet; this effect can occur from a ruptured descemetocele. Surgical intervention would be an ideal treatment option given the axial location and absence of blood vessels that would initiate healing. Figure 10A Corneal perforation with lens luxation through the perforation site (red arrows, A & B). There is superficial neovascularization extending from the limbus (black arrow, B), with concurrent edema and heavy cellular infiltrate (green arrows, A & B). The iris is displaced anteriorly (orange arrows, A), because of the lens luxation, which has pigment along the equator from the ciliary body and posterior iris. 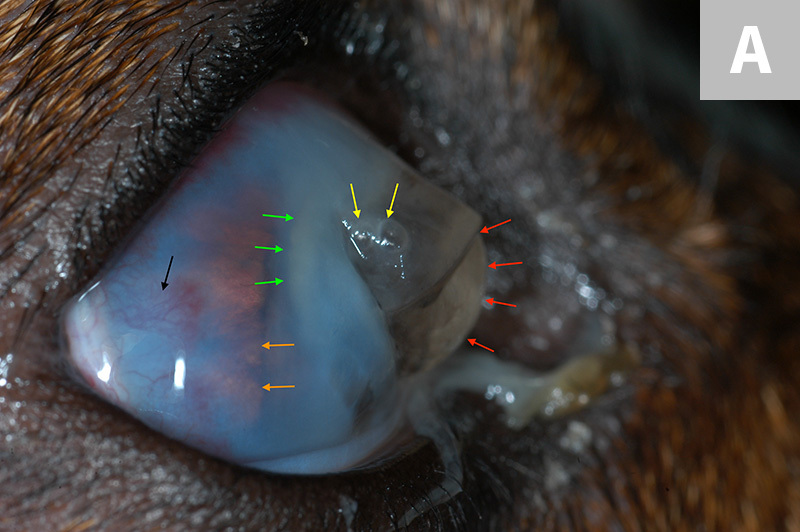 Two small air bubbles present on the lens are associated with the rupture (yellow arrows, A & B). Figure 10B Corneal perforation with lens luxation through the perforation site (red arrows, A & B). There is superficial neovascularization extending from the limbus (black arrow, B), with concurrent edema and heavy cellular infiltrate (green arrows, A & B). The iris is displaced anteriorly (orange arrows, A), because of the lens luxation, which has pigment along the equator from the ciliary body and posterior iris. Two small air bubbles present on the lens are associated with the rupture (yellow arrows, A & B). Figure 11 Intraoperative image showing corneal perforation before surgical repair. A protruding fibrin plug is present at the perforation site, but no pigment or blood is evident. There is neovascularization at the limbus 360° around but most noticeable dorsal (yellow arrows) to the perforation site. The cornea has white cellular infiltrate surrounding the perforation site, which is suggestive of infection (black arrows). Figure 12 Very large corneal perforation 48 hours post-occurrence. The cornea is misshapen and diffusely edematous with neovascularization, particularly in the periphery where cornea is still present (black arrows). The perforation is occupied by a fibrin plug admixed superficially with blood and pigment (yellow arrows). Figure 13 Corneal perforation with hyphema, mild corneal edema, and neovascularization in the intact cornea. The slightly triangular perforation is plugged with fibrin and blood. 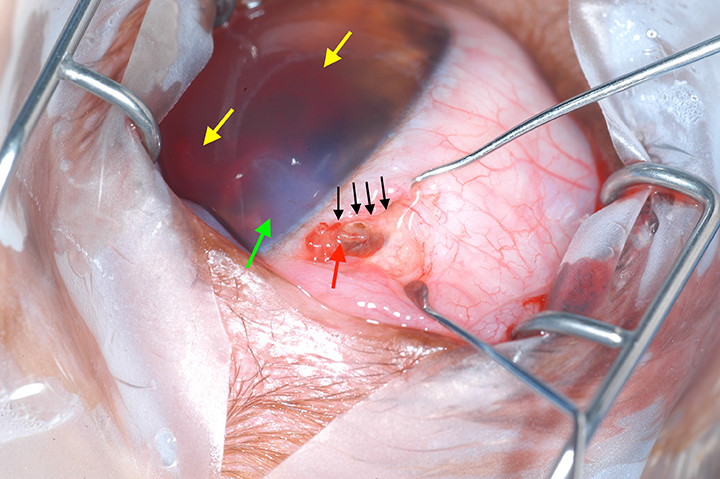 Fibrin and blood can also be seen in the anterior chamber (yellow arrows). 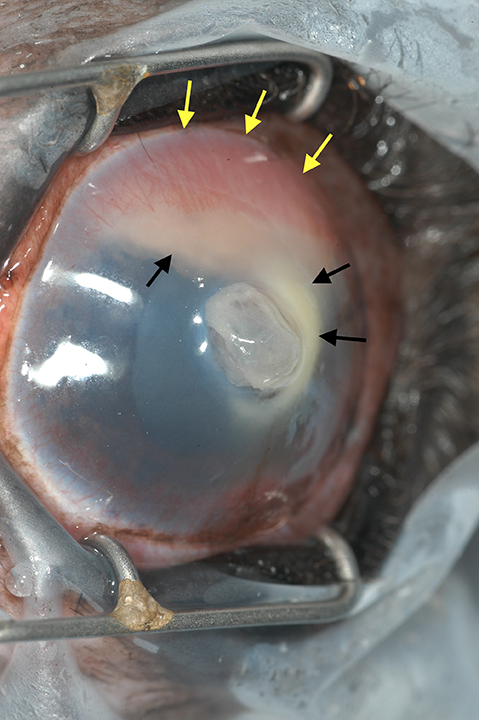 Figure 14 Large fibrin clot mushrooming over the lateral aspect of the cornea (white arrows). The edge of the perforation is hidden beneath the fibrin clot. The remainder of the cornea is diffusely edematous (red arrow), with neovascularization at the limbus. Dziezyc J, Millichamp NJ. Color Atlas of Canine and Feline Ophthalmology. 1st ed. St. Louis, MI. Elsevier Saunders. 2004.